Can you help support our development and new projects in 2018? While most of what we do is funded as discrete projects by the EU, governments and charitable foundations, many of our activities depend on voluntary donations from the public – people like you! Handbooks and guides. The more that we can get our know-how into the hands of the people who can put it to use, the more impact we can make in the world. Policy advocacy. ORC will speak up for the things that you believe in and make real change in the right places. Farmhouse Refurbishment Planning. We need around £10,000 for architectural and planning work and to prepare a prospectus for the refurbishment project ahead, which will turn Elm Farm House in to a state of the art training centre. Building on existing research. We have research and development projects planned and need your help to be able to take them forward. Every penny you give can help us to do just that. Training and bursaries. 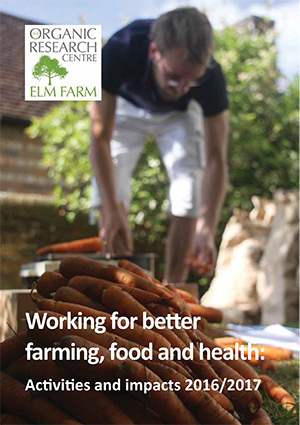 Students and farmers from all over Europe and the UK come to Elm Farm. What they learn here inspires others and builds the organic communities knowledge, across the world. Conservation work at Elm Farm We’d need to use local volunteers and increase staff resource to make the most of the many mixed-use areas on the farm including the walking trails and growing agroforestry systems here at Elm Farm. The Organic Research Centre delivers work in eight programme areas, and each of these requires donations in order to progress. As a charity we also require funding for the facilities and resources to underpin each of the eight programme areas. Please click here or below to see details of work that you can support in each of these programme areas. The most valuable thing a supporter can do for ORC is to make a £5,000+ unrestricted donation, and in doing so joining our exclusive group of Organic Ambassadors. Please click here to read more about donating at Organic Ambassador level. Further details on any of these projects can be provided on request – please email fundraising@organicresearchcentre.com. If you would like to see how donations to the Charity have been used previously, please see our annual reports. 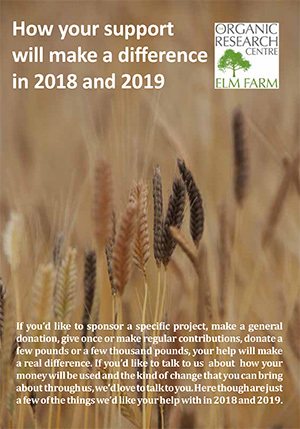 In return for a commitment to a regular donation to support our work, the new Farmer and Business Supporters' Group provides an opportunity for us to say thank you for your support and to give you something back, including an opportunity to have a say in, and get involved with, our future activities. You can find more information about the group here. While one-off donations are always very welcome, a regular monthly or annual donation provides us with increased security of income and allows us to provide you some benefits in return. By becoming a Friend you will receive the ORC Bulletin, additional information on our activities, free ORC publications, discounts on or free access to events and invitations to Friends-only events. As with one-off donations, you can Gift Aid your regular Friend donations using the Standing Order Mandate form, increasing their value to us by 25%. By including us in your Will or adding a Codicil (PDF 378KB), you will be enabling us to continue to develop our work and activities well into the future. As we are a charity, all legacies to ORC are free from inheritance tax. You can find further information on legacy donation from your solicitor or by visiting legacy giving sites such as www.rememberacharity.org.uk. We may not be registered as a member with these sites, but you can find full details about us on the Charity Commission website www.charitycommission.gov.uk. You or your solicitor will need to use the formal charity name Progressive Farming Trust Ltd or our Registered Charity number 281276 to find us there. The option to donate shares to a charity applies to many listed shares and unit and investment trusts. As a charitable donation this is normally free of capital gains tax. To be sure of the current tax implications, you should check with your financial advisor or HMRC.